Markets, indeed economies as a whole, are complex adaptive systems. Like biological ecosystems, they continuously and spontaneously order themselves in response to unfolding influences, large and small, internal and external. When it comes to nature, we’re both part of it and a profound external influence. We shape the world around us for ill and sometimes for good, not only through deliberate actions but also, of course, merely by being here. Some of our activities and their consequences in the natural world, were we only willing to listen, could teach us much about how to better manage man-made systems such as the markets and the economy. Forestry management provides a striking example. Our natural inclination is to put fires out wherever we can, not only to safeguard valuable property but also to protect the forests themselves and their many wild occupants. In pursuing this practice, however, subtle changes take place over time. Dead trees and fallen branches accumulate and the undergrowth becomes thicker and much more widespread. Finally a fire occurs that we’re unable to stop, one that feeds on all the detritus to produce firestorms so powerful they can at times fundamentally change a whole ecosystem. I don’t doubt Krugman’s right to suggest we’re in the early stages of a Third Depression. The last few years have been a first instalment in what will prove to be a drawnout, volatile and painful downturn. I also agree it’s “primarily [about] a failure of policy”. Where we differ is on the nature of these failures. First though, some points of agreement. Krugman was vocally unhappy about much of what took place during the boom years. He railed against the excesses of the financial system, and the deregulatory zeal that allowed it to run so completely out of control. He expected it all to end badly, although perhaps not quite to the degree it has. He’s also consistently argued that deflation, not inflation, is the greatest danger for the foreseeable future. No argument, from me at least, on any of this. Nor do I really want to argue with his critique of the simplistic view put forward by those he terms “the apostles of austerity”; namely, that cutting spending and/or raising taxes won’t bring on further short-term pain. It will. To pretend otherwise is disingenuous at best. Credit booms generate economic and financial imbalances. The longer a boom lasts, and the more extreme the expansion, the greater these will be. The results show up in balance sheets and income statements. Whether it’s an individual household, economic sector or the external position of a country, that entity’s financial statements tell the tale. 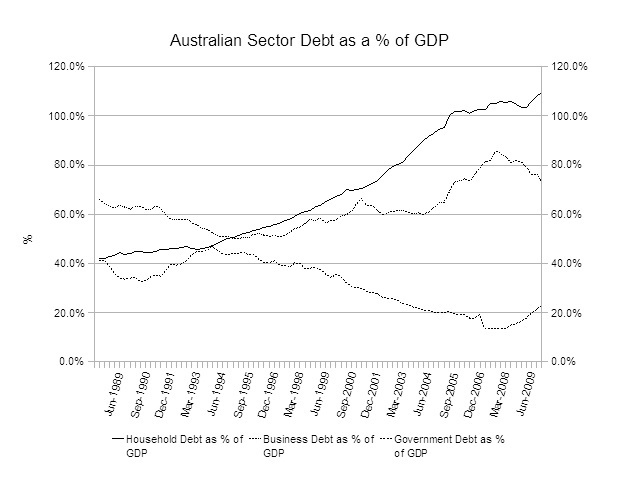 In Australia’s case, sectoral debt figures show remarkably divergent trends in credit growth. At 73.1%, non-financial business debt as a percentage of GDP is only 7% higher than in 1988. The high point in the intervening years was 85.6% in Sept 2007. General government debt (federal and state combined) actually declined, from 42.1% in 1988 to 22.7% now. Prior to the crisis, it hit a low of 13.4%. The real action was in the household sector, where debt to GDP started at 42% in 1988 and is now 109.7%. Spending ain’t spending, to paraphrase the old Castrol ad about oils. Where government stimulus spending ends up, and how, are quite as vital as the spending itself. In the end, it’s no more immune to the logic of productivity than private investment, even though the primary goal will often be something quite different. Unfortunately, discussions about the merits of stimulus spending often skate around this issue. There’s another complication that also too rarely sees the light of day. Each credit induced boom generates its own combination of imbalances and unless government policy takes these into account, efforts to cope with the ensuing crisis will be kneecapped. Credit ain’t just credit, either. By their very nature, booms generated by a fractional reserve banking system don’t result from the lending of genuine savings. Much of the credit produced is in effect ex-nihilo, literally “out of nothing”. Loans are made, recycled back into the banking system when spent and then for the most part lent out again in an endless cycle. Out of it comes a rapidly expanding and intricately interlocked set of IOUs. The only constraints are the reserve requirements (if any) imposed on the system together with a need for continued loan demand. In a non-fractional reserve system, money lent is no longer available to the lender until it’s paid back. The act of lending is literally the transfer of the use of those funds for the duration of the loan. Not so under our system. As depositors, we all retain access to most of our funds while they are at the same time lent out in the continuous process described above. As a result, for as long as the credit expansion lasts we’re collectively misled into acting as if there were more resources available than in fact exist. Certain structural consequences must follow and these are common to every credit induced boom. Another website dedicated to finance and economics? Yes yes, I know. That very thought has long kept me from making such a foolish move. So what tipped me over the edge? Well, two things. First, early this year I finished a piece aimed at bringing the whole business of money and credit within the grasp of an intelligent lay reader. Not only how they’re created and why things have gone so terribly wrong, but also what a more sane and stable financial system might look like. Even allowing for my bias, I was happy with it. Unfortunately, it fell into an awkward hole; much too short to be a book but too long to be sensibly published anywhere else. So, it went into the too hard basket.